James Gordon Bennett, John Bigelow, William Cullen Bryant, Horace Greeley. House Speaker Galusha Grow visited President Lincoln in the White House one night. Seeing the initials W and W on one of the pigeonholes on President Lincoln’s desk, Grow said: “Pardon my curiosity, but I cannot help wondering what W. And W. stands for.” Smiling, President Lincoln, said “W and W. Stands for Weed and Wood, Thurlow and Fernandy — a pair of them.”1 Democrat Wood and Republican Weed represented the unique set of powerful New Yorkers with which Mr. Lincoln had to deal. In June 1863, Welles recorded a similar emotional response as Confederates invaded Pennsylvania: “General [John E.] Wool, Governor [Edwin D] Morgan, and Mayor [George] Opdyke make a combined effort to retain the Roanoke at New York, and write me most earnestly on the subject. The idea that New York is in danger is an absurdity, and, with a naval force always at the navy yard and in the harbor, and with forts and military force, is such a remote contingency that the most timid lady need not be, and is not, alarmed. Morgan and Opdyke, Governor and Mayor, have responsibilities that are perhaps excusable, but not General Wool, who feeds on panic and fosters excitement.”4 What Welles seemed to have forgotten that “Governor Morgan” was by then “Senator Morgan” and a not easily excitable man. Ironically, New York City was in danger — but from its own citizens. Only a two weeks later, a different kind of panic seized New York City. This time it was justified New York was the site of four days of rioting against military conscription — that the Lincoln Administration has imposed on the city. “Even as national issues and decisions affected New York, New York events affected the nation, if only because it was the most populous and richest state in the Union. Census takers counted 3,880,735 people in New York in 1860, nearly 800,000 more than in 1850 and almost one million ahead of the next most populated state Pennsylvania,” wrote historian Paula Baker.5 Panic seized Washington as well as New York. The pressure on Mr. Lincoln from New York began before the election and continued afterward. I have been two hours with Pa. Gentleman It was a strange revelation, for he represents V[allandigham] of Ohio, W[ood]. of N-Y, and other strange People, including McClellan, all of whom he proposes to bring to the support of the Country! I was unprepared for this, but of course was not surprised. I saw [Dean] Richmond at Albany yesterday, and explained [freely?] to him. He went heartily into the Programme for finishing Rebellion, saying that upon that basis the Democracy of New-York would come promptly to the rescue. Richmond was the New York Democratic chairman. Weed was the powerful Republican boss although his influence was diminishing by the beginning of the Civil War. The two were represented part of the ever-shifting coalition of those willing in New York to support. Party lines in New York were hard to follow. But sometimes, party lines were less important than railroad lines. Both parties had leaders who were active railroad executive and promoters. Democrat Dean Richmond was an executive of the New York Central which operated the main lines between Albany and Buffalo. So was Albany Democrat Erastus Corning, who served as head of the New York Central for 11 years until he was replaced in a coupled by Richmond in 1865. Attorney John V. S. L. Pruyn, who served as a state senator before he was succeeded Corning in Congress in 1863, was an active railroad director who would have succeeded Corning as head of the New York Central had not Richmond beat him to the honor. But Republicans were not always happy to help the New York Central — in part because of the Democratic executives like Corning and Richmond who ran it. 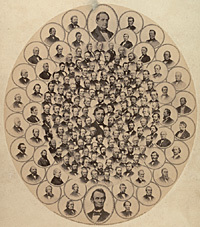 Historian Sidney David Brummer noted that in the 1860 legislative session, three “bills of a partisan nature were aimed at the new York Central Railroad. Many Republicans believed that the influence of this corporation was used against their party and in behalf of the Democrats; and despite the denials of that accusation on the part of the directors, a persistent agitation was kept up for several years against the company. One of the bills prevented voting by proxy by railroad stockholders, the intent probably being to get control of the road from Erastus Corning by depriving him of the votes of foreign stockholders, and perhaps (as charged) to transfer the road’s influence to Republicans.”12 The railroad has insulated itself from such criticism by 1863 — splitting the composition of its board between Republicans and Democrats. Wherever New York railroads were discussed, Thurlow Weed was sure to be in the vicinity. In 1860 Weed admitted — in a peculiarly convoluted and defensive way — that “there have been legislative measures, right in themselves, and promotive of the general welfare, in which we have had, in common with other citizens, ultimate or prospective interests. In this category belong New York city railroads.”13 Republican Weed’s interests were so defined that the New York Central’s Erastus Corning, a Democrat, took a trip to Europe in 1856, he left Weed to watch over his railroad interests. By the end of the Civil War, Democratic National Chairman August Belmont, was also involved in the railroad business. “More and more often August’s name was being linked to the Erie and the Tweed rings, both of which were composed of people for whom he had little use and no respect,” wrote Belmont biographer David M. Black. ‘But he like most New York financiers was doing business with them.”29 No wonder when up-and-coming Republican politician Chauncey M. Depew was considering a job offer from Cornelius Vanderbilt after the Civil War that would have forced him to turn down an appointment as U.S. Minister to Japan, Vanderbilt said: “Railroads are the career for a young man; there is nothing in politics. Don’t be a damned fool.”30 By 1867, Vanderbilt had taken over and expanded the New York Central system. Law, of course, was being more than slightly unreasonable; the government was still having difficulty get troops from New York City into Washington to defend it and no one had more interest in reopening the railroad link to Washington than President Lincoln. But reasonableness was not something Mr. Lincoln came to expect from New York City politicians or from newspaper editors or businessmen. Their interests were too diverse, their appetites were too big, and their feuds were too divisive. As the 1860 elections demonstrated, these politicians were a difficult group to organize — split as they were by factions, by schemes, and by ambitions. Noah Brooks, Washington in Lincoln’s Time: A Memoir of the Civil War Era by the Newspaperman Who Knew Lincoln Best, p. 264. Gideon Welles, Diary of Gideon Welles, Volume I, p. 123 (September 10, 1862). Gideon Welles, Diary of Gideon Welles, Volume I, p. 347 (June 27, 1863). Milton M. Klein, editor, The Empire State: A History of New York, (Paula Baker, New York during the Civil War and Reconstruction”). John Bigelow, Retrospections of an Active Life, p. New York: The Baker and Taylor Co., 1909. Abraham Lincoln Papers at the Library of Congress. Transcribed and Annotated by the Lincoln Studies Center, Knox College. Galesburg, Illinois. (Letter from Thurlow Weed to William H. Seward, November 21, 1863). Sidney David Brummer, Political History of New York State During the Period of the Civil War, p. 41. Sidney David Brummer, Political History of New York State During the Period of the Civil War, p. 32. Glyndon Van Deusen, Thurlow Weed: Wizard of the Lobby, p. 245. James A. Rawley, Edwin D. Morgan, 1811-1883: Merchant in Politics, p. 40 (Letter from Edwin D. Morgan to Erastus Corning, April 18, 1854). Sidney David Brummer, Political History of New York State During the Period of the Civil War, p. 42. Sidney David Brummer, Political History of New York State During the Period of the Civil War, p. 22-23 (Albany Evening Journal, August 27, 1860). David M. Black, The King of Fifth Avenue, p. 374-375. Glyndon Van Deusen, William Henry Seward, p. 263. Stewart Mitchell, Horatio Seymour of New York, p. 204. James A. Rawley, Edwin D. Morgan, 1811-1883: Merchant in Politics, p. 79 (Letter from Henry Martin to Edwin D. Morgan, September 11, 1860). Jeter Allen Isely, Horace Greeley and the Republican Party, 1863-1861: A Study of the New York Tribune, p. 278. James A. Rawley, Edwin D. Morgan, 1811-1883: Merchant in Politics, p. 79 (Letter from Henry Martin to Edwin D. Morgan, September 14, 1860). James A. Rawley, Edwin D. Morgan, 1811-1883: Merchant in Politics, p. 101 (New York Evening Post, April 16, 1860). James A. Rawley, Edwin D. Morgan, 1811-1883: Merchant in Politics, p. 99. David M. Ellis, Jams A. Frost, Harold C. Syrett, and Harry J. Carman, A History of New York State, p. 238. Jeter Allen Isely, Horace Greeley and the Republican Party, 1863-1861: A Study of the New York Tribune, p. 280. Sidney David Brummer, Political History of New York State During the Period of the Civil War, p. 45 (New York Tribune, August 20, 1860). Sidney David Brummer, Political History of New York State During the Period of the Civil War, p. 23 (Albany Evening Journal, September 21, 1861). Sidney David Brummer, Political History of New York State During the Period of the Civil War, p. 285. David M. Black, The King of Fifth Avenue, p. 374. Chauncey M. Depew, My Memories of Eighty Years, p. 14-15. Jeter Allen Isely, Horace Greeley and the Republican Party, 1863-1861: A Study of the New York Tribune, . Glyndon Van Deusen, Thurlow Weed: Wizard of the Lobby, p. 315. Francis B. Carpenter, The Inner Life of Abraham Lincoln: Six Months at the White House, p. 156-157.